Well, it is probably the most rewarding organized baseball activity you will find out there. 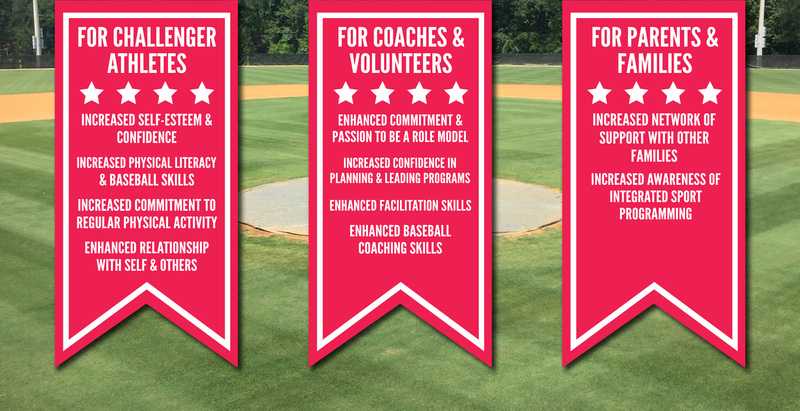 Challenger Baseball is the division that allows children with cognitive or physical disabilities the opportunity to enjoy all the benefits of playing baseball, in an environment that caters to their very special needs. Our philosophy is very simple: “play, just for fun! !” You can’t beat it. The “game” is played in a safe, recreational environment, where no score is kept. Ablebodied “Buddies” are assigned (one on one) to each participant. These Buddies are “mentors” to the Challenger players, and assist with their involvement in the game. Pushing wheelchairs around the basepath … assisting players in how to hold the bat and swing … providing protection for the Challenger player from a batted ball … these are just a few of the ways the Buddies offer a better experience for the participants in Challenger Baseball. Each participant is treated like every other player in the conventional baseball program. All players are on a team, and are outfitted in uniforms and use the same equipment. A team picture is a must for Challenger Baseball, as it is in the other divisions … a team party to finish the season … a team trophy … these are all part of the Challenger Baseball “experience” for every child that plays. Last but not least, the smiles are plentiful and free!! The joy on the face of each participant in Challenger Baseball, makes you realize just how much fun they are having. No more all star pressures!! No more playing time issues!! Everyone just has fun … kind of what baseball is supposed to be all about.